I’ve reached out to you guys on Instagram to ask what you would like to hear me talk about on the podcast, and I think this week’s topic is going to resonate with and be helpful to a lot of you. Starting a business is something I know many of you feel like you are meant to do in this world, to create something of value, and live the life of your dreams. But how? There are so many options that I can’t even list the different types of businesses you could create, but I’m showing you how you can identify where your passions lie and start taking action in that direction. The possibilities are endless and we have access to so many opportunities. This week, I’m going to help you overcome any feeling of overwhelm or confusion you might be stuck in to start taking advantage of the world we live in and follow your heart! How to figure out what kind of business to create. 2 questions you can ask to help you identify your business. Why most people get stuck in deciding what they want to do. How to start thinking about your potential business. What starting a business is all about. Join me for my upcoming live free training by visiting http://lindseymangocoaching.com/manifest. Hello, how are you guys? I hope you are having a beautiful day. I am so excited to be speaking over your – what is it? Your car speakers, your headphones, your computer, who knows. I’m grateful to be here with you. I feel like I know you guys and I hope you feel like you know me too. I’m so excited though to talk about today’s episode because the other week I asked my audience on Instagram story – follow me @lindseymango_ – I asked what do you guys want to hear podcast episodes about. So I know so many of you guys are going to connect with this question, and I am so excited to talk more about it. So one of my followers said different types of businesses to start and what they all have in common. And so what I kind of took this question as is like, what options are there and how do you start them. And if I took this the wrong way tell me if I’m wrong, but I realize that so many of you guys want to have businesses but you’re like, how do I start and what do I do? What options exist? And so this is what I wanted to cover today. So a lot of you guys know in your heart, in your mind, that you are meant to have a business, that you’re meant to create something. You know you’re meant for more but then you get stuck at this place of what are the options, what could I even do? And here’s what I want you to know. We are all making this up. I’m going to say it again. We’re all making this up. What’s so amazing is that we live in a world now where we have access to things at our fingertips and the possibilities are completely endless. And we have the opportunity to create something completely new, that we have the opportunity to create a business that people haven’t even heard of. And that I think is something that can be overwhelming but also super exciting. So I want to challenge you guys to take the exciting approach because again, I couldn’t even list off and really answer this question of the different types of businesses because there are so many. I don’t even – there are so many ways to create a business. So the way that you can actually figure this out for yourself is to ask yourself like, what do I want to offer the world? And there’s two questions that can really help you. Is there a problem that you want to solve for people or is there a solution or something that you want to give to people? Not necessarily a solution to a problem. Is there something that you know will add value or bring value to people’s lives or elevate it. If you can do that, you can create a business. So how do you actually do that? If there is no stamp of approval of like, this is an actual business and this isn’t a business is you decide. And how you decide and how I teach my people in Mango Magic Business Academy and in everything to how I teach them to decide is by following their heart. So my question for all of you guys, if this is where you’re stuck is what is the thing that you would want to do in the world? What business would you want to start if you won the lottery? If you had everything you already wanted, what is the thing that you would be doing? And how would you offer it? How would you want to offer it? Usually the reason why people get stuck here is because they feel like one, that there’s a right way to do this and they’re like okay, if I do it the wrong way then this isn’t going to work. And two, they are fearful of just creating. They feel like – they get stuck in the how. They get stuck in the confusion. And so what I want to do right now is give you the opportunity to remove that confusion. You guys have heard me talk about this before. Confusion is just your mind being afraid to fail. It’s getting stuck in fear. So I want you guys to ask yourself that question that I said earlier about if you won the lottery, if you had everything you want, what business would you want to offer the world. And my next question is if there was no right way to do it and there was no limit, how would you want to offer your product or service to the world? Period. Now, there’s so many other pieces. This is honestly why I built Mango Magic Business Academy because you’re like, well what do I charge and all of these things, but here’s the thing I want you guys to know. If you are committed to creating a business, if you are fully committed, you will not get stuck in the how. The only reason we get stuck in the how is because part of us is afraid. We’re afraid of failure, we’re afraid of doing it wrong, and we don’t fully believe. So I want you guys to start thinking about it from the place of if hundreds of thousands of people were waiting for you to offer this product or service or whatever it is, this business that you wanted to offer, how would you want to offer it to them? How would you want to structure it? What would you want to do? How would you want to create it? And that is going to be your path. Now, you’re going to learn things as you go and that’s the other thing, like I said, people are afraid of failing. I will tell you guys, I had six to seven corporate jobs. I tried network marketing twice until I got here and all of it was a part of my path to getting here. So don’t let yourself stay stuck in inaction because you’re waiting for the right action and trust that by following your heart and what you’re passionate about, you’re going to learn and grow in the process and it will ultimately lead you and guide you to where you are meant to go. My business is going to continue to evolve and grow and change over time because I’m going to keep following my heart and I’m going to keep learning, I’m going to keep growing. So I want to give you guys permission right now to decide what business you want to create. Now, maybe there is for this specific business you want to create, some sort of qualification. Maybe that means – if you want to be a lawyer, whatever it is, you have to have a law degree. There’s certain governing bodies, but the thing is if you’re committed to getting there, then you will figure out how to get there. So then you’ll say okay I need to do this process, I need to research this, I need to figure it out. 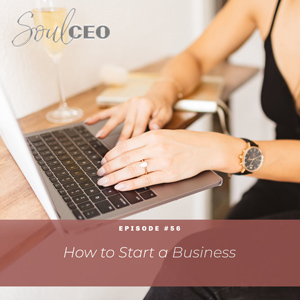 And so I think that’s one of the biggest things when it comes to starting a business and how to decide on what business to start is that we get so stuck in the how that we don’t do anything. And where you figure it out is by doing things. So again, if you guys were committed to starting a business, if you were committed no matter what, would the questions that are coming up for you, what would you do about them? You’d go find solutions. You’d go figure it out. You’d try different things, and that’s what this is really about. So if there’s no wrong answers, if you can build a business however you wanted, if you can build a product or service in any way that you wanted, and if you are committed to doing that, and if you trusted that hundreds and thousands of people were waiting for it as a result, then what would you do? What would you offer? What would it look like? And build your business around that. Then over time, you’re going to figure out okay, this thing isn’t working, this little part is working. That’s how I’ve learned and grown in my business. And so I want you guys to know, starting a business is just about deciding. It’s about choosing. You don’t get a stamp of approval from anything that tells you like, now you can go be this type of business owner. Certain certifications, yes, for certain things, but the first and biggest thing about this is fully deciding. Period. So what would you guys have to think and believe to just decide? What would you have to trust in order to choose the path that you want to take? And what will you have to work through, what how or what questions are coming up and how can you be committed to finding solutions to them in the moment? Your business can be whatever you want it to be. You live in such a beautiful, amazing world, you can create whatever it is that you want. Follow the things that your heart wants to offer the world. You cannot go wrong when you do that. I love you guys. I cannot wait to continue watching so many of you create businesses, lives, and love everything that fulfills the life of your dreams because we only get one life. Why not live it to the complete fullest? I love you guys. I will talk to you next week. I hope you have a beautiful day. Bye. Thank you so much for joining me for today’s episode of Soul CEO. If you want to go even deeper into how to create a vision of the life you really want, how to become the woman in that vision and how to deal with the roadblocks we all face along the way, head over to lindseymangocoaching.com/high-vibe-formula to get your free training of my High-Vibe Formula.